The Best Way To Keep Track Of Your Progress! The Walkdesk™ app allows you to keep track of all your Walkdesk™ sessions. The app is available for iPhone as a free download in the App Store. Using more than one Walkdesk™? No problem, you can connect the app to every compatible Walkdesk™ while keeping all your activity data together. Easily keep track of you current session with our session display. 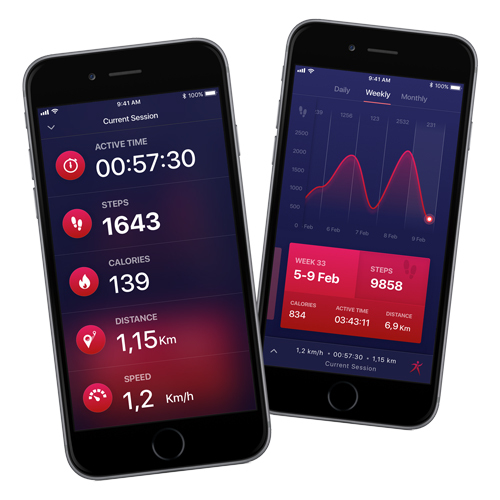 Important metrics like duration, distance, speed, steps and calories are all available at a glance. Want to get a nice overview over all your Walkdesk™ activity? In the app you can see all your activity by day, week or month. This way you can easily find out how active you’ve been.